W Hotels’ W Seattle has begun a renovation of its Living Room (lobby area), bar and restaurant with the closure of its first-floor public spaces. 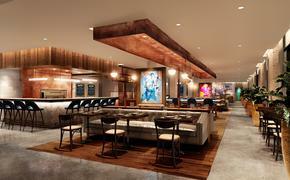 Upon completion in early March, the hotel will unveil Trace restaurant and bar. The kitchen will be helmed by Chef de Cuisine Steven Ariel, who focuses on local, organic and sustainable products. The 26-floor, 424-room hotel’s first floor is being concealed from public viewing during the three months of construction. However, guests can catch a glimpse of the project via the “Peek-a-Booth,” an interactive kiosk and video.